"The orc is the antithesis of civilized man. They think nothing of tomorrow, knowing only whatever warlike passion possesses them at the moment, taking what they want and despoiling what they don’t. Never be mistaken: they’re not men, they’re monsters." 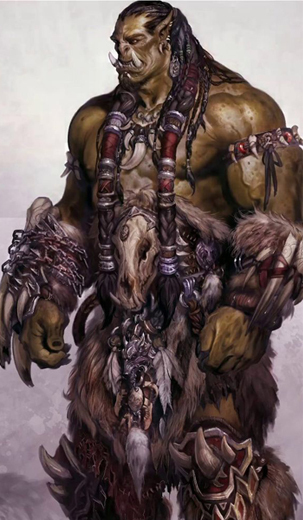 The Orcs (orcish "kuni", dwarven "ork", elven "arch") are a race of savage humanoids commonly found in northern Nora. They claim that they arrived from across the sea from a legendary land called Orkalv. Orcs often use the name of their mythical homeland as a battle cry, thus leading other peoples to known them as "orcs". Living in clans all across northern Nora, orcs ride on Dire Boars or dire wolves and raid nearby humanoid settlements. They are natural enemies with elves, they loathe ogres, and enslave goblins. They have been raiding all lands and peoples in the north for thousands of years, reaching as far south as Fetch Lake. The orcs also had several major conflicts with the eastern oni nation as well as the ogre tribes of the Wyrmspires. Orcs are divided into two distinct ethno-cultures, the Thervs and the Greuths, divided by the Bluog Seirff Sea. The repeatedly harried the Aquarian Empire during its time and had a major conflict with Nora during the Orcwars. The Thervs live in western Nora and are relatively smaller, while the larger Greuths live in eastern Nora and the Wyrmspire Mountains. Orcs are naturally chaotic and unorganized, acting on their emotions and instincts rather than out of reason and logic. Within their own settlements, however, they are surprisingly cultured and non-hostile. Their ways still savage, they care for their communities and families. Orcs of both ethnicities exhibit varied skin tones, but each large family unit stay uniform with each other. It has been observed that when a clan of orcs move to a new area, within three generations, their skin tone will shift to match their environment. Therv orcs look less bestial than their more savage northern kin, but are still obviously nonhuman. They are somewhat hairy, with long manes of bristly hair on their heads, shoulders, and backs. Their faces are less porcine than the mountain orcs, with the exception of their tusks. They have yellow, orange, or red eyes, lupine ears, and black or gray hair. Therv orcs are more apt to wear "civilized" clothing than mountain orcs, and prefer varying shades of brown, black, blue, and other dark colors. Skin tones are usually gray with mottled patches of lighter or darker gray on the chest and flanks. Average Height: male: 5'0" – 6'10", female: 4'7" – 6'3"
A Greuth orc is quite obviously a monstrous creature to most of the civilized folk. Greuths look vaguely like primitive humans but are a fair bit taller at seven or more feet in height; a rare few exceed eight feet in height. They have stocky, powerful necks, and their bestial heads seem to sit directly on their massive shoulders. Their eyes are always a deep shade of red, and their faces are dominated by porcine snouts and large tusks. Greuths often weave braids and tiny bones into their thick matted hair, which is usually black. Their clothing is crude and primitive, often composed of unpleasant colors like blood red, mustard yellow, yellow-green, and deep purple. They are far from the cleanest race and delight in decorating their bodies with scars and warpaint. "Orcs are fearful of their gods, and, if one play one's cards right they can be controlled through that fear and made to dance to any tune." Orcs believe their gods to be invincible. They see the principles that define them and their deities at work every day in the world around them-nature rewards the strong and mercilessly eliminates the weak and the infirm. Orcs don't revere their gods as much as they fear them; every tribe has superstitions about how to avert their wrath or bring their favor. This deep-seated uncertainty and fear comes forth in the form of savagery and relentlessness, as orcs ravage and kill to appease the gods in order to avoid their terrible retribution. Their chief deities are Kalabrath, Shaydis and Malym. Orcs revere Kalabrath over all gods. The god of Fire and War is a natural god for the kuni to gravitate to. To the orcs, Kalabrath is served by two lesser deities, Strategy "Garehsns" and Brutality "Swinthei". Each warrior must have the wisdom to know when to call on one god or the other in his times of need. Kalabrath pushes his children to increase their numbers so they may be his instrument of revenge against the realms of elves, humans, and dwarves. Kalabrath leads his orcs on a mission of ceaseless slaughter, fueled by a fiery unending rage that seeks to lay waste to the civilized world through the Harrowing and revel in its anguish. While Kalabrath is the external force that pushes the orcs to victory over their enemies, it is the influence of Shaydis that binds them together and makes the orcs internally cohesive. She is the force that keeps the explosive rage of Kalabrath from bursting the ores apart. If it was not for the followers of Shaydis, it is possible that the race of orcs would be no more than small bands of warrior-nomads, scratching out a meager existence, rather than a force capable of great destruction. Far from the den's war hearth, within the protective depths of the caves, the followers of Shaydis tend the orc brood, raising them to be strong and cruel like their progenitors. By invoking the power of superstitions, omens, and traditions, these claws of Shaydis hold the tribe together through ritual, fear and, if necessary, force. Malym is often depicted as consumed by rot and covered in oozing pustules, utterly repulsive except for his hands, which are pure white and free of any blemish. Malym has no mouth and never utters a sound, so that he may come in absolute silence for his chosen. The followers of Malym are allowed to dwell on the fringes of the tribe, but are looked upon with distaste and unease. They interact with the tribe mostly on occasions of death, claiming the bones of fallen warriors to add to the ossuary shrines of Malym, and sometimes during shamanic rites when contact with spirits occurs. Orcs sometimes enter battle astride yan. By doing so they honor the creatures as well as their deity, because legends tell that Swinthei also rides a great bull into battle. No ore will eat or harm one of these sacred beasts, which are believed to be imbued with Swinthei's spirit. Bears, especially cave bears, are sacred to Shaydis. She is often thought to take the guise of an enormous cave bear. Her followers honor this aspect of her by keeping cave bears as pets to guard the whelping pens that are filled with squabbling young. Luthic's devoted also grow their claws long and paint them black to mimic the fearsome talons of their goddess. Luthic rewards them by making their claws as strong and tough as iron. The empire could never conquer the orcs, despite many attempts and countless battles. They were attracted to the fire after the fall of their favored moon. Traditionally the rights of the family would be passed down through the paternal side, but in rare occasions, one could take the maternal side of their family also. Leaders of clans are called Khagan. Each Khagan has a number of lieutenants called khagi. A khagi is part guardian, brother and companion. They act as a bodyguard and as unit commanders on the battlefield. They share what is his, including wives. Sometimes, when multiple clans band together, a warchief, or ur-khagan, is declared to lead the clans. There are no orc berserkers. Many theories exist to guess why. However, when an orc is born with demon blood, they become Tanarukk and live in a constant battle-rage. Every orc has a knife. Two, if they want to last the year and three if they have any ambition. Every mother's main duty is to ensure their children eat and that they get a knife when five summers old. The Harrowing (Aggwitheins) is the central concept behind orc culture. It is the name given to the constant state of warfare orcs find themselves in. This warfare is to gain territory or raid resources. The orcs view the Harrowing as a burning wild fire; if they stay in one place too long, they dwindle and die, but with the wind at their backs the fire will burn for eternity. Orcs already consider the world and everything in it already belonging to them. Therefore there is no need to ask or trade for any item as all that is needed is to take it. The root of orc culture is the idea of family and the idea that all orcs are the One People, regardless of clan. Copper held a special value, most likely for its ceremonial purposes. This copper was beaten into sheets or plates, and then painted with mythological figures. The sheets were used for decorating wooden carvings, or just kept for the sake of prestige. Individual pieces of copper were sometimes given names based on their value. The value of any given piece is defined by the number of wool blankets last traded for them. In this system, it was considered prestigious for a buyer to purchase the same piece of copper at a higher price than it was previously sold. During potlatch, copper pieces would be brought out, and bids were placed on them by rival chiefs. The highest bidder would then have the honour of buying said copper piece. If a host still holds a surplus of copper even after throwing an expensive potlatch, he would then be considered a wealthy and important man. Further evidence of copper's significance is shown in the fact that highly ranked members of the tribes often have the word for "copper" in their names. Due to the importance of copper and its use as a mark of status, there is a shaming ritual, the copper cutting ceremony, involving breaking copper plaques. The act represents a challenge; if the target cannot break a plaque of equal or greater value, he or she is shamed. No orc would ever enslave another orc. However, humans a goblins make excellent slaves. Most orc clans stick to an old orc addage. "KIll elves, ransom dwarves and eat humans." Contrary to popular belief, orcs don't serve death; they fear it. Orcs spend their entire lives trying to display their mastery over death. If one of their number should die, they perform a mourning raid. This is where a band of orcs go from their tribe to find other humanoids to slay and join in death. In this, the orcs show they do not cower in the face of death, but rather they thrust back. Orcs who die "a good death" are sent to Kalabrath by the priests of Malym. The priests seek out the bodies of such fallen heroes and sever their heads, boil or smoke them to rid them of most of the flesh, and then use a ritual punch to break out the bridge of the nose and leave the skull with a single eye. Orcs that appreciate the strength and ferocity of a foe might choose to honor that enemy by giving it the same treatment. The bodies of orcs that die in a failed battle are left behind; they were weak and don't deserve to join Kalabrath. Those that die of old age have typically already been taken into Malym's fold, and their bones are used to build furnishings and structures in the area of the lair dedicated to the worship of Malym. There is a small subculture of orcs spread throughout the clans of necromancy. It can be seen as a splinter religion, or a cult. It is tolerated by the other orcs, but many distrust it and the necromancers can easily be seen as scapegoats for many scenarios. Technically omnivorous, orcs prefer meat (excluding beef) and aren't adverse to eating other races. Eating fallen enemy warriors after a battle can alternatively be a sign of respect or an attempt to show dominance. Knifetongue Clan: Located in the Caitalam Wildlands. Wyvern’s Sting Clan: An orc clan with a talent for primal magic. It leaders are shamans, while other prominent members are adepts. Blood Talon Clan: Legend speaks that a clan of orcs turned against Kalabrath and worshiped Vgir. For their punishment and reward, they were turned into werewolves. Now, they live in eastern Tir'Ein, roaming the dark forests, spreading their curse. They appear as wolves with white fur that they enjoy decorating with blood. Fang of the Black Wolf Clan: This clan, found in the eastern edges of Tir'Ein have bred a special breed of worgs on which to ride, called Darkwolves. Skull and Sickle Clan: A small clan ruled by King Three-Tusk. Their warriors are brutish and powerful. They are known for beheading their victims and, after treating them alchemically, using the heads as decorations around the village. Spine In Fist Clan: The largest and most feared orc clan. They reside in the northern Wyrmspires and wage war with the Skullcrusher Tribe of Ogres. Stolen Eye Clan: Located in Thantena Forest. deadcrow-clan: Located in the Fellwood. Usually three syllables long, ending in -th or -an. An orc only allows those with authority over them to their full name, such as Shamans and chieftains, or the orc's personal religious leader. All other's only referred to the orc by their first syllable. Drakabaun would only be referred to as Drak, a very popular orc name. Most orc names derive from words in their language that have some complex meaning or hidden significance to their families. Orc use personal kennings as surnames that are derived from great acts or merits a previous ancestor was lauded for, but some exceptional orcs earn their own kennings.